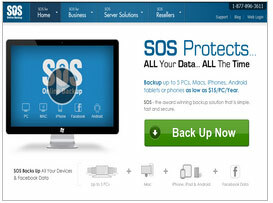 SOS Online backup, established in 2001 considered as a pioneer &technology trend setter in online backup. SOS provides an explicit solution, operating 11 data centers across the globe coupled with military grade security level and unmatched customer support. SOS Online Backup is facilitating millions of satisfied clients. They offers different packages suiting individuals, small & medium sized companies, multi-nationals & IT houses. SOS online backup, being voted as PC Magazine Editors’ Choice for four years in a row is highly regarded as secure and easy to use online backup. SOS allows backup for multiple system which authorizes to sync as many devices and computer as required, under single account. SOS provided restoration of lost file from any sync system. A distinctive feature of SOS online backup is versioning of everything. It makes you totally forget about security and repeatedly saving of your file, every little alteration will be archived indefinitely on SOS server. Social media data protection is another unique feature, user can protect data on their Facebook account. Such characteristics escorted SOS online backup in winning Laptop Magazine’s Editor Choice award twice. SOS Online Backup is an Award Winning Cloud Data Storage Solution for Home & Business to secure digital data from PC, MAC, iPhone/iPad & Android.